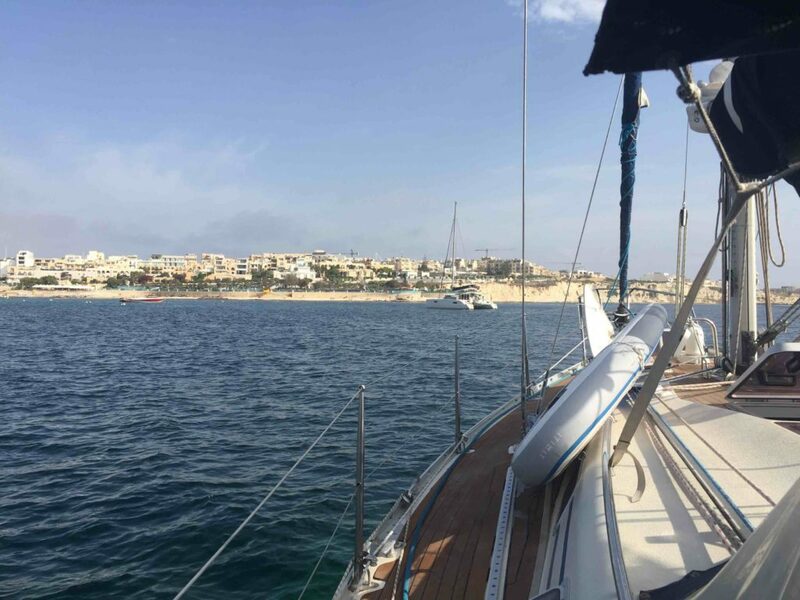 On the 30th of August we had arrived in Malta. 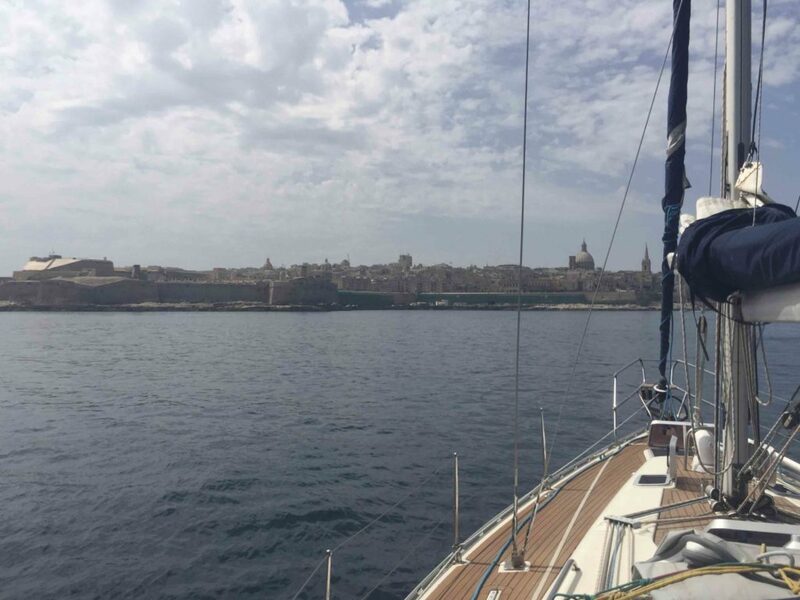 As we had booked a marina in Valletta for the winter from the 1st of October, this meant we had a whole month to cruise around Malta. 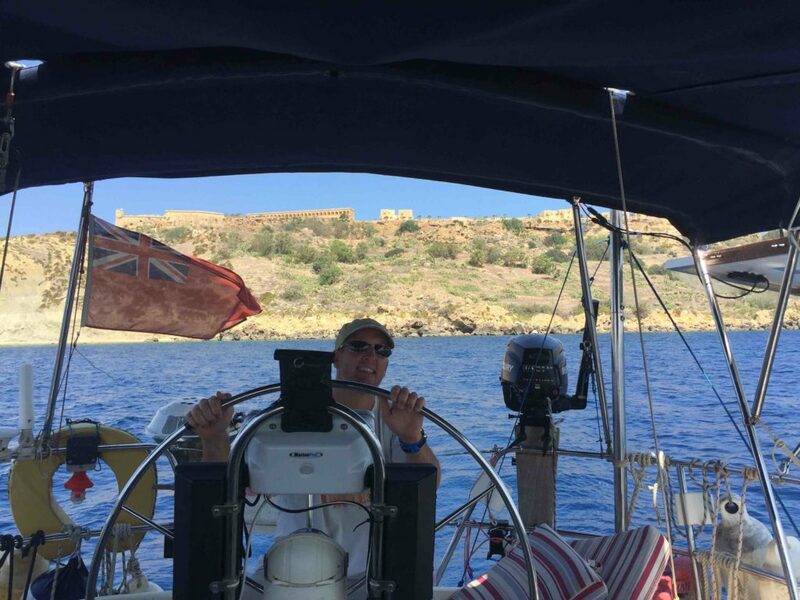 Of course in September the weather can turn quite bad in the Med so we kept our options open and were in no way committed beforehand to spending the entire month at anchor. As it turned out, we had arrived at the start of a heatwave with a temperature of 30 degrees and little wind. Perfect cruising weather. 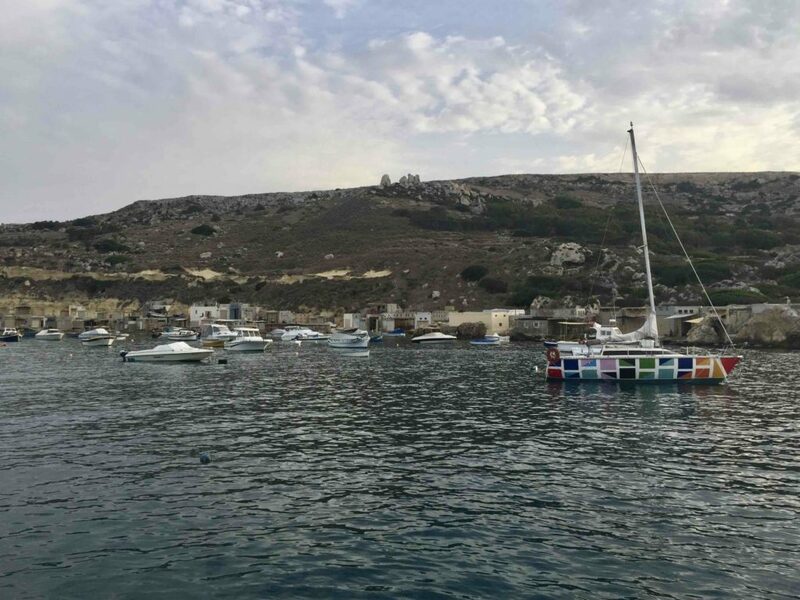 After spending the first night after our crossing from Sardinia at a small anchorage in Gozo, we checked the internet for a better place to stay for a few nights. The Westerly swell made this spot quite uncomfortable. On the go again. 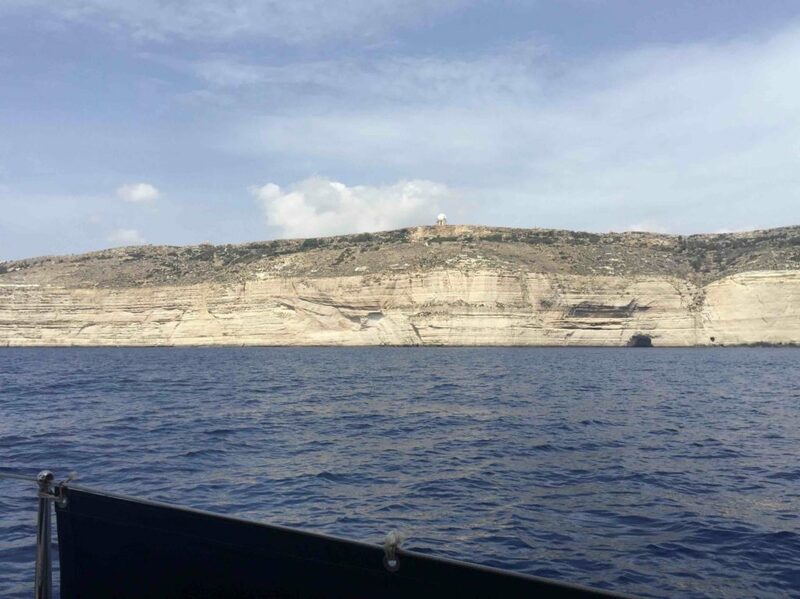 In the background the Gunpowder Arsenal and Fort Chambray on Gozo. 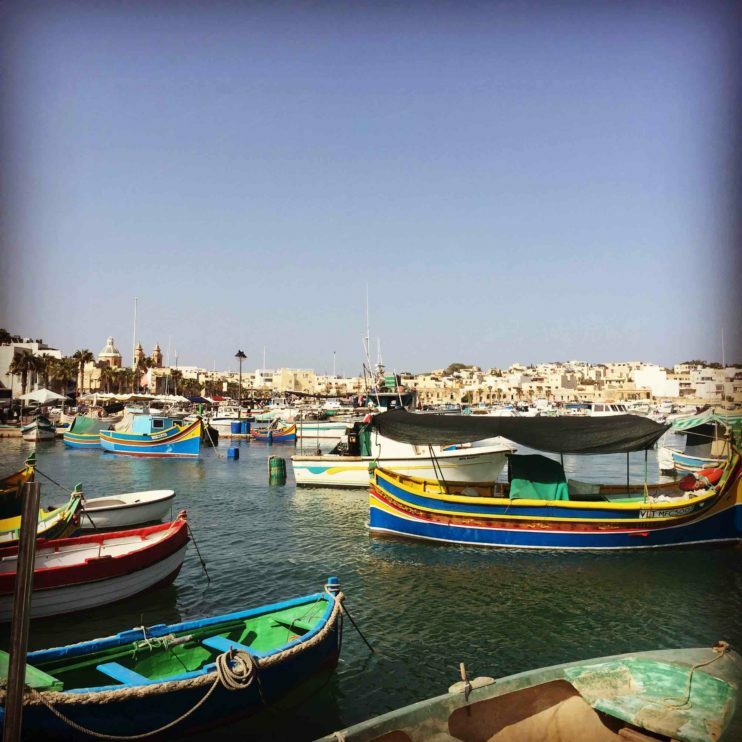 We opted for Mellieha Bay on the Eastern side of the main island of Malta. Although it was only a 6 mile trip, we had to pay close attention especially at the beginning. 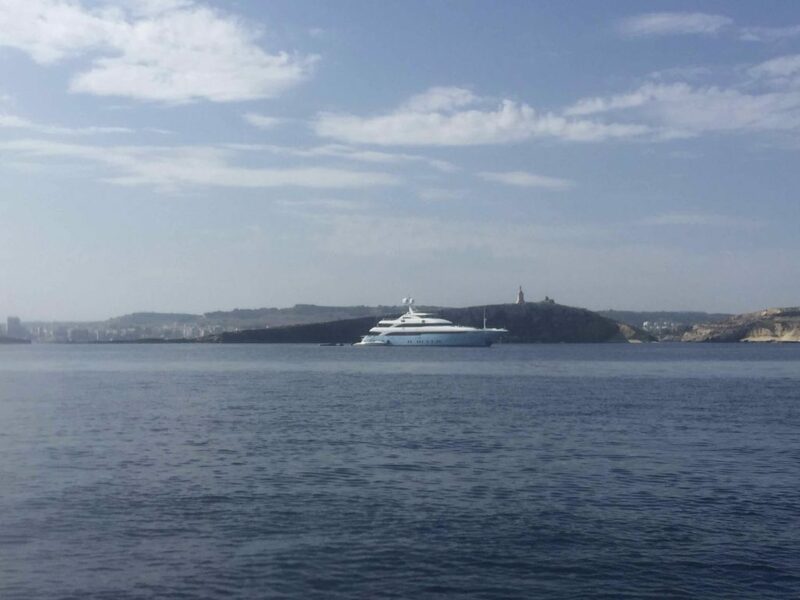 We had to cross a busy ferry route transporting passengers from Gozo to Malta and vice versa, and also dodge the various motorboats and tourist boats. 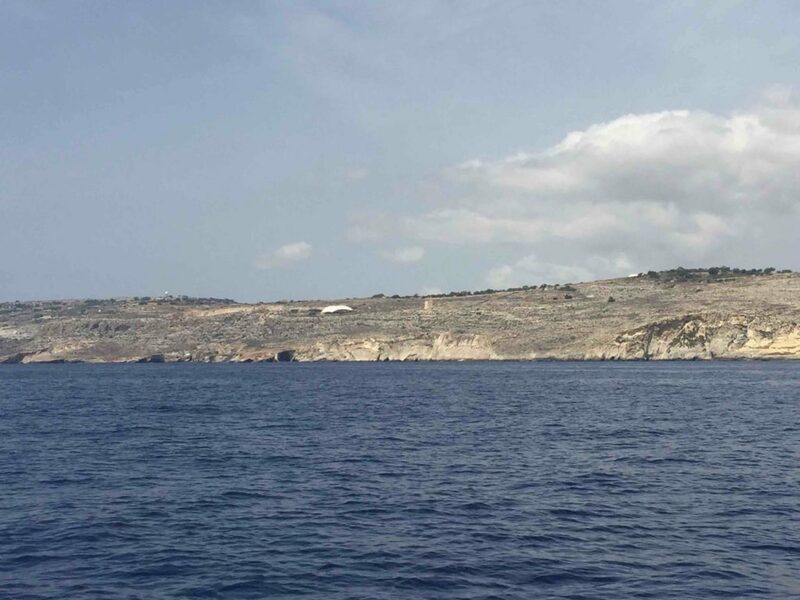 On entering Mallieha Bay there was a big fish farm and some buoys to keep an eye out for. 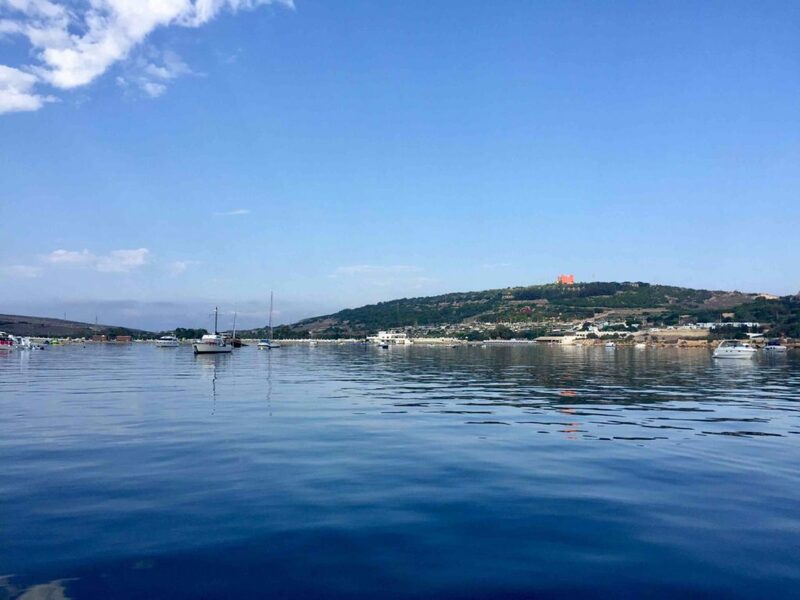 The bay itself provided lots of space for anchoring at a good depth (between 7 to 4 meters). But this was obviously a popular place for locals and tourists and the summer season was still in full swing. So there was a lot of traffic during the day. Still, it was nowhere near as hectic or aggressive as in Sardinia. Mellieha Bay, view on the Red Tower. A powerboat raft-up next to Goodvibes. Luckily for us there was a speed limit of 10 knots in the anchorage, so they had to go further out to sea to show their real powers. 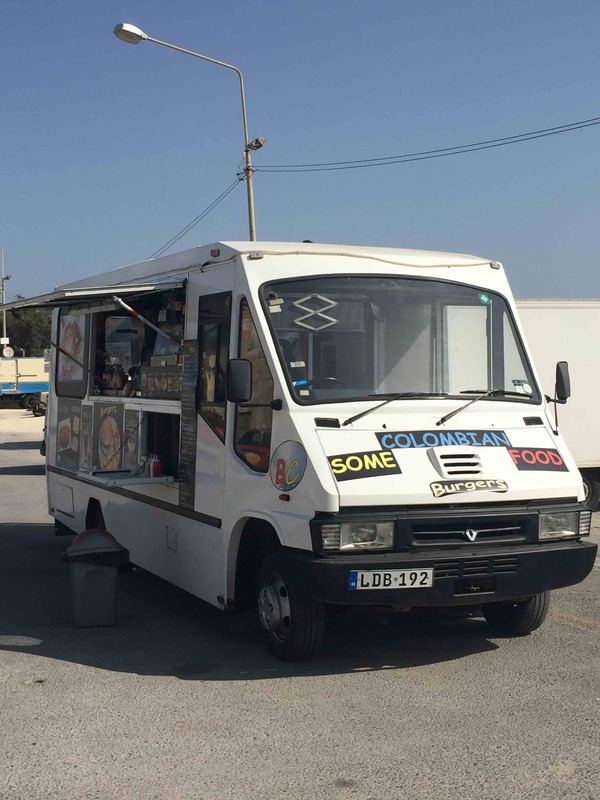 After a few days relaxing in Mellieha Bay we were in desperate need of a laundromat and had to top up our fuel and water. 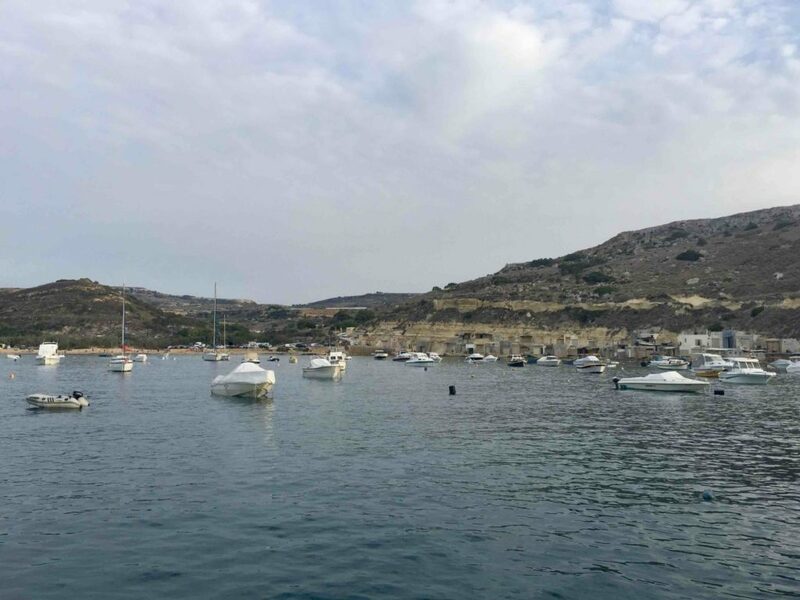 The marina where we were going to stay for the winter had availability for us for a few days, so off we went down the East coast of Malta past St Paul’s Bay and St. Julians towards Valletta. Superyacht anchored in front of St. Paul’s island. 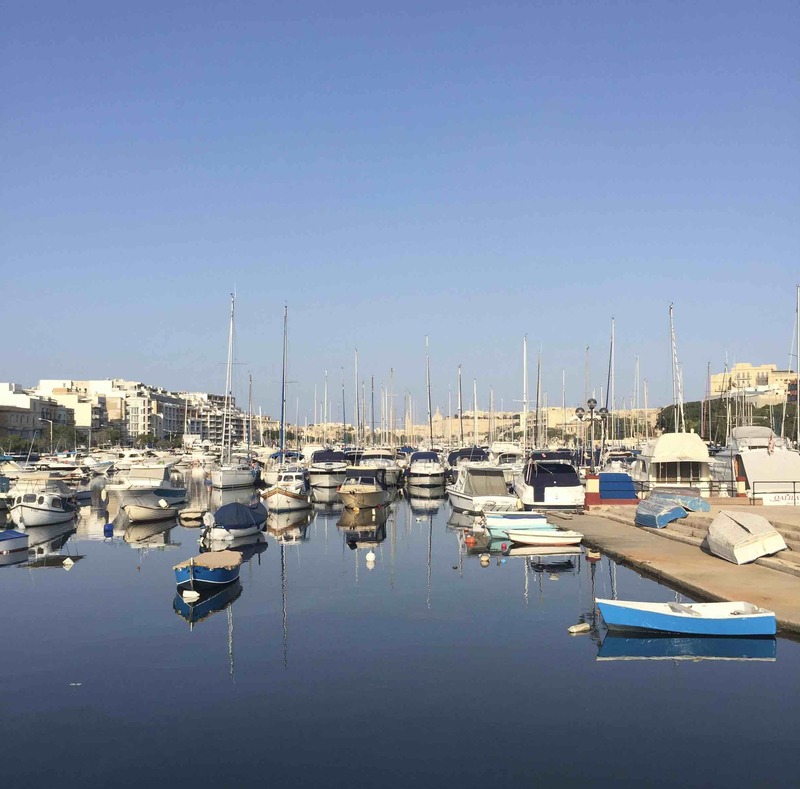 ‘Our’ marina is officially not in Valletta but it’s right next to it (in Msida), so as we approached we had a marvellous view of the historic capital. It was very exciting to be in the place where we would soon be living. 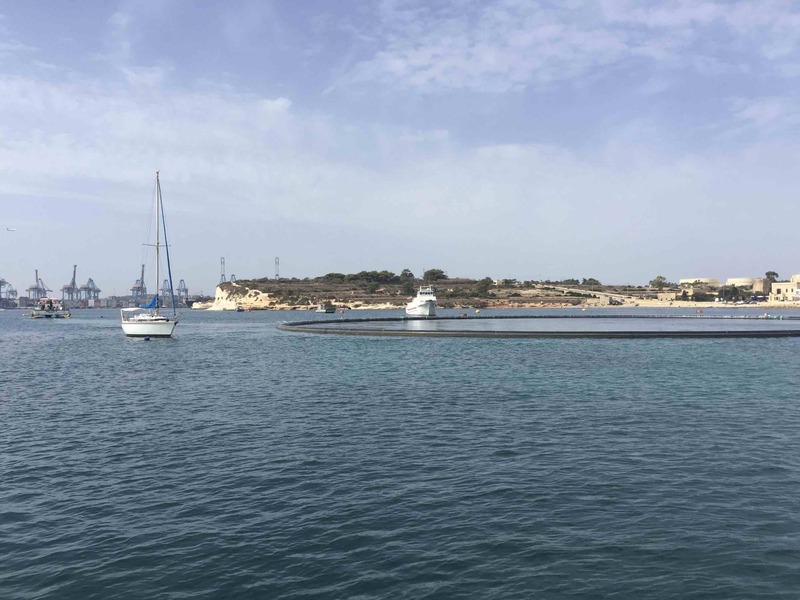 The first impressions were very positive: the marina staff was friendly and the amenities very modern (digital water + electricity meters and online topup, electronic fobs for gate and waste disposal access). 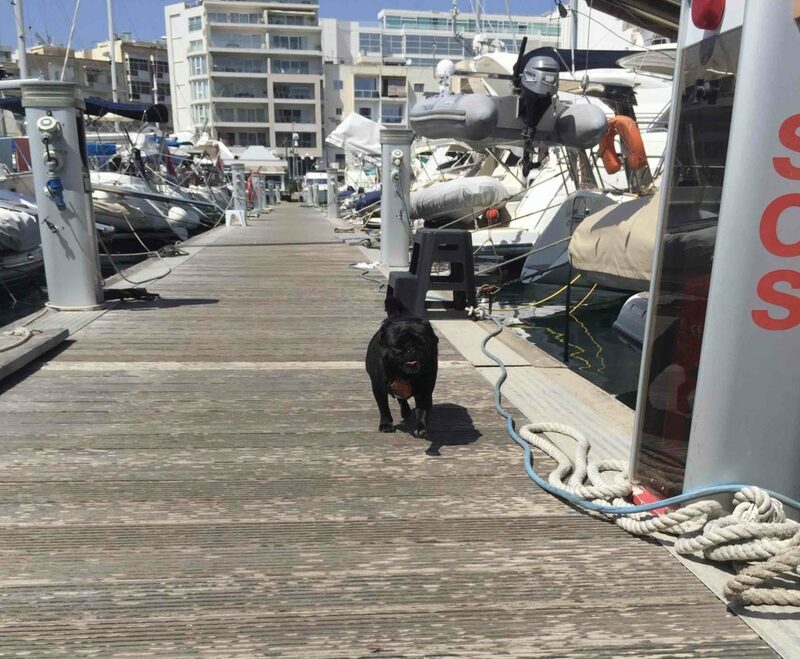 We were moored on a floating pontoon with planks provided for easy access on to the quay. 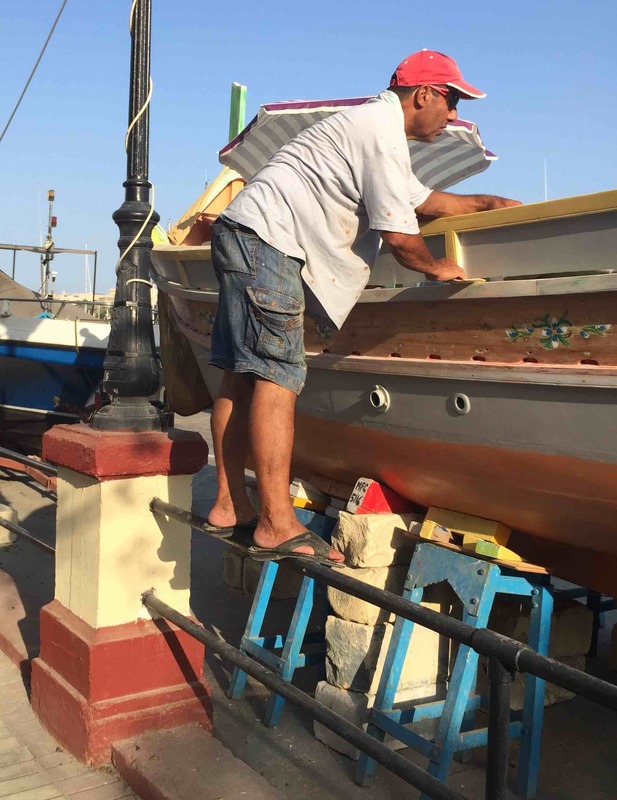 This meant we could easily step from our stern on to land – without having to climb over our pulpit or fabricate our own passerelle as we had to do in Gibraltar. What’s more, the marina is very sheltered of heavy wind and swell, so even when it is storming the boats are safe. 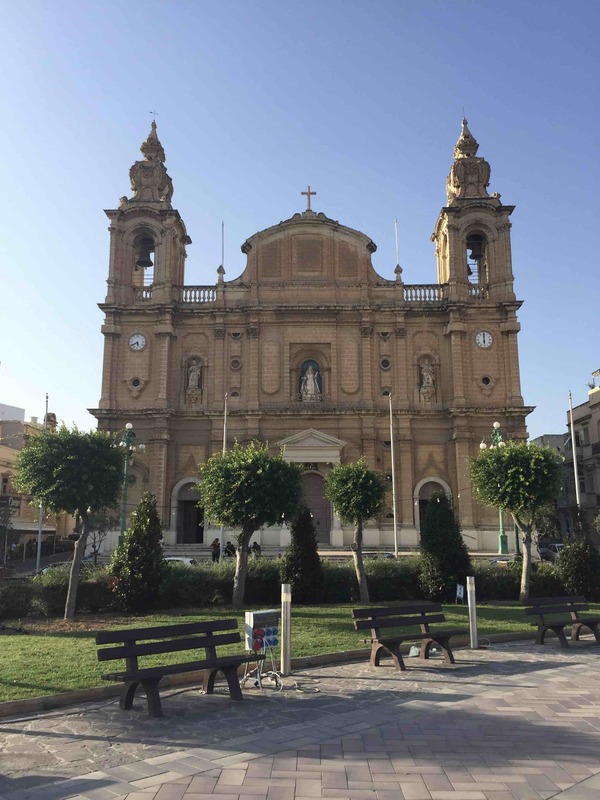 The town of Msida (and adjacent Sliema, Ta’ Xbiex’, Pieta and other towns, as they are really all part of the same agglomeration) is a mix of contemporary coffeeshops and new office buildings on the one hand and closed-down workshops, decennia old local businesses and shabby (sometimes charming) historic buildings on the other hand. 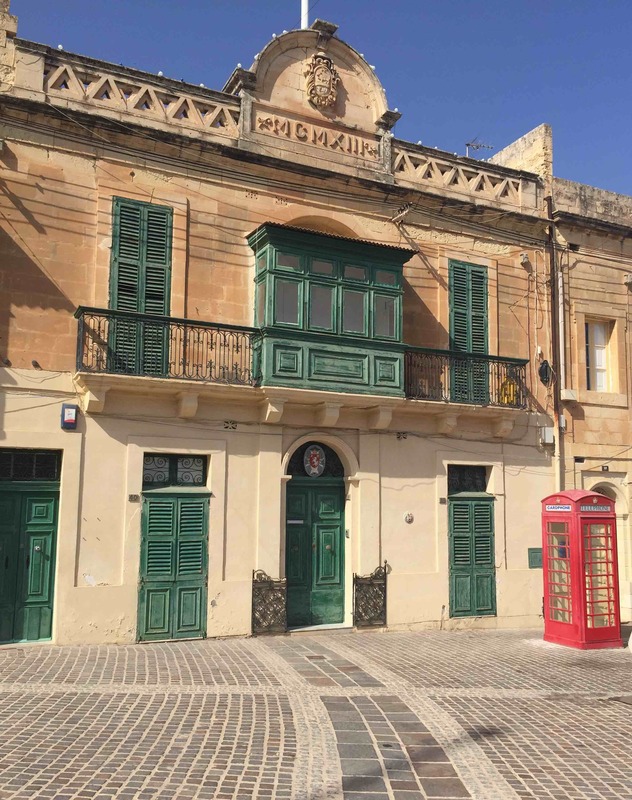 The population reflects this mix between old and new + local and international as well. You can see Central Africans at the bus stop next to French speaking professionals in office attire. 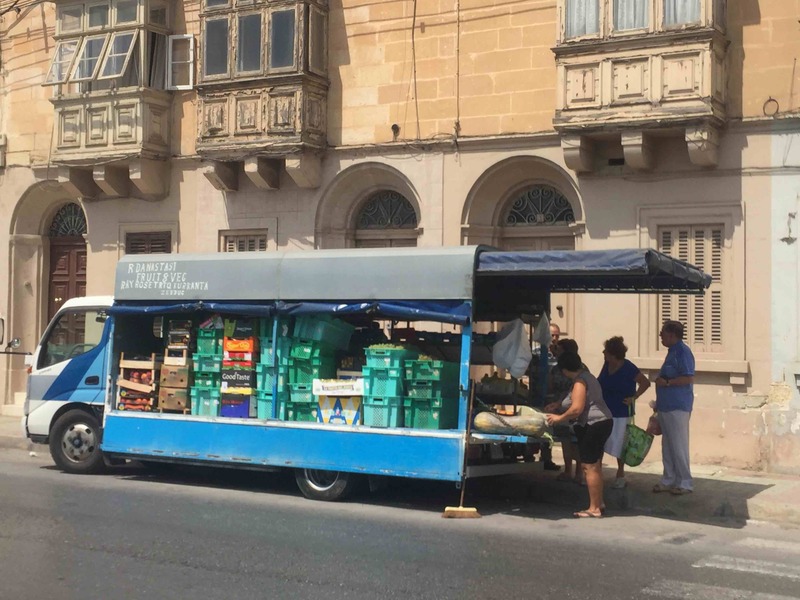 Maltese fishermen work on their boat while, across the road, the Scandinavian employees from a major betting company eat their lunch in a Asian wok eatery. 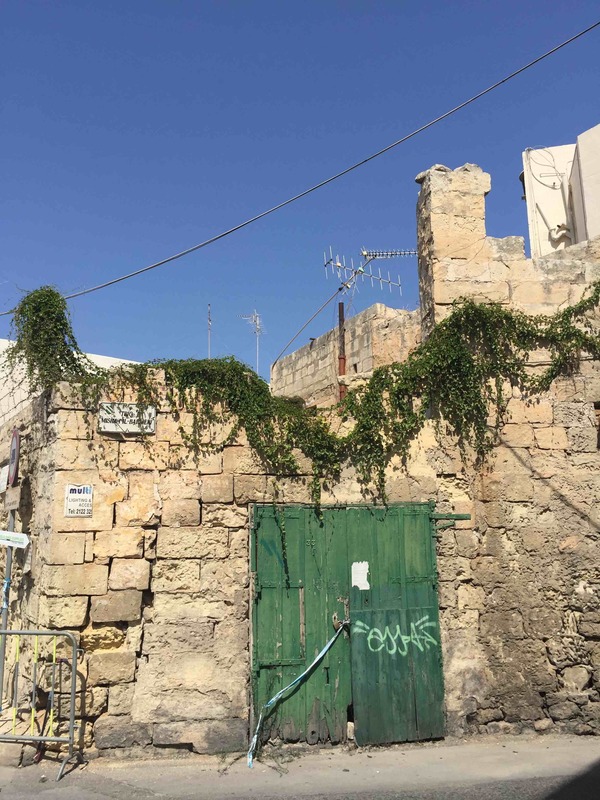 It’s a bit messy and there is a lot of demolishing and building going on, but there also seems to be a lot of development and new opportunities. It will be interesting to see how this area will look like in 10 years time. 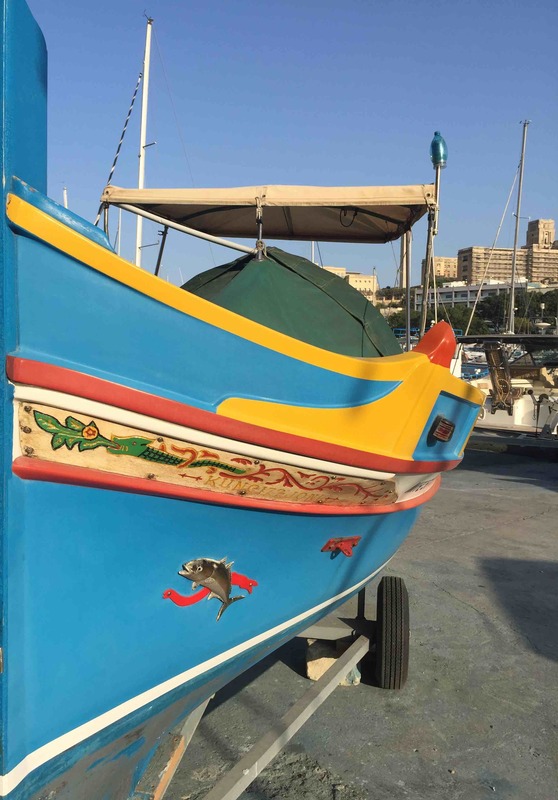 A luzzu, the traditional Maltese fishing boat painted in bright colours. For us, it meant we were really looking forward to spending some time here over the winter. 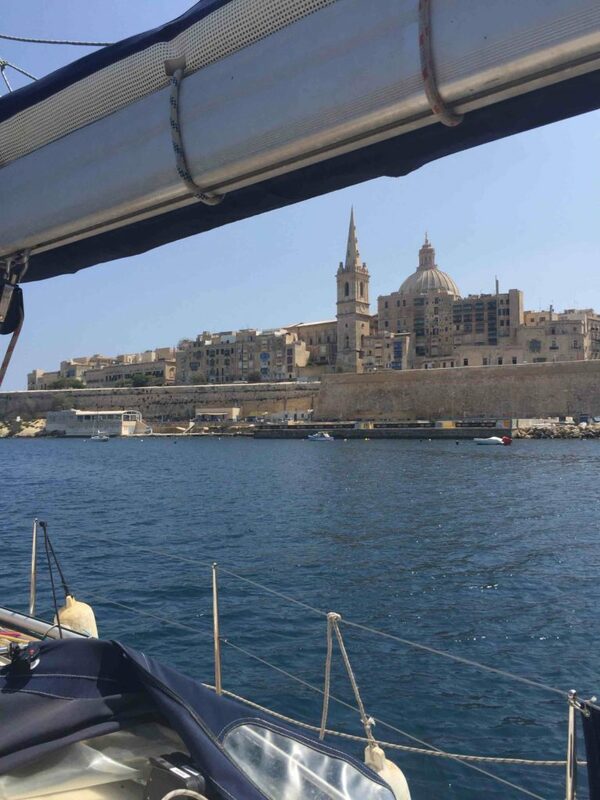 We almost regretted leaving the marina again, but we were also keen to make the most of the good weather to see more of Malta from the water. 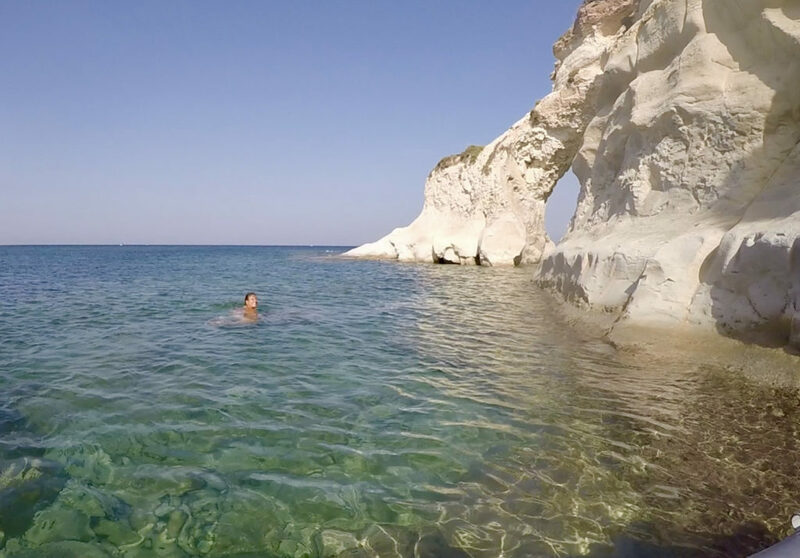 On the Southeast there are a few well-positioned anchor bays. We picked the Bay of St. Thomas as it was the largest. The South side of the bay had beautiful yellow rock walls and some inlets with sandy beaches which I first explored by sup-board. Later we took the dinghy to go for a little swim. It was still very hot, and at times very humid, so a dive in the cool water was very welcome. Sup-board ready for deployment. 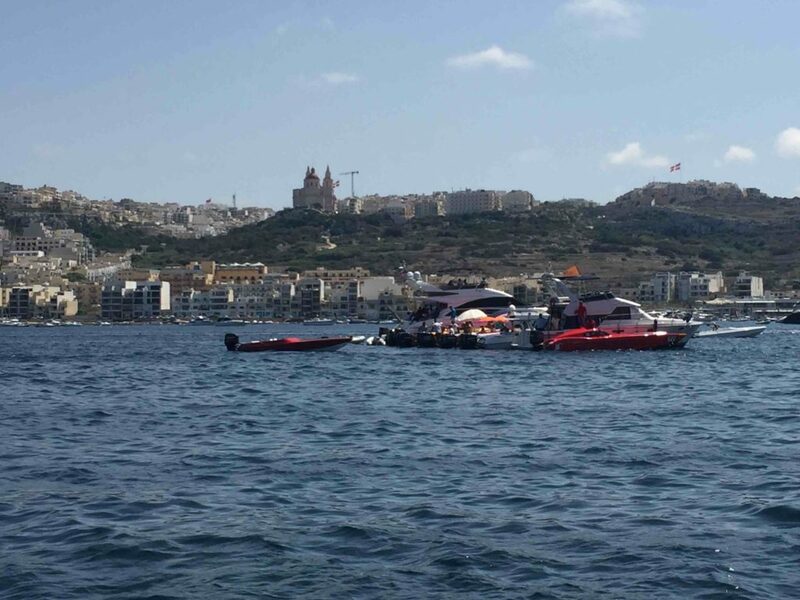 Normally we deflate it but as we were only doing short distances in Malta we kept it inflated on deck. 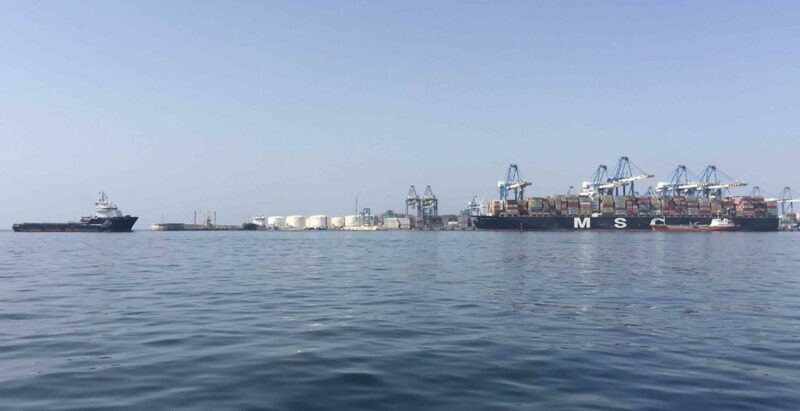 Just around the corner from St.Thomas Bay lies the Malta freeport: one of the largest international container ports in Europe. 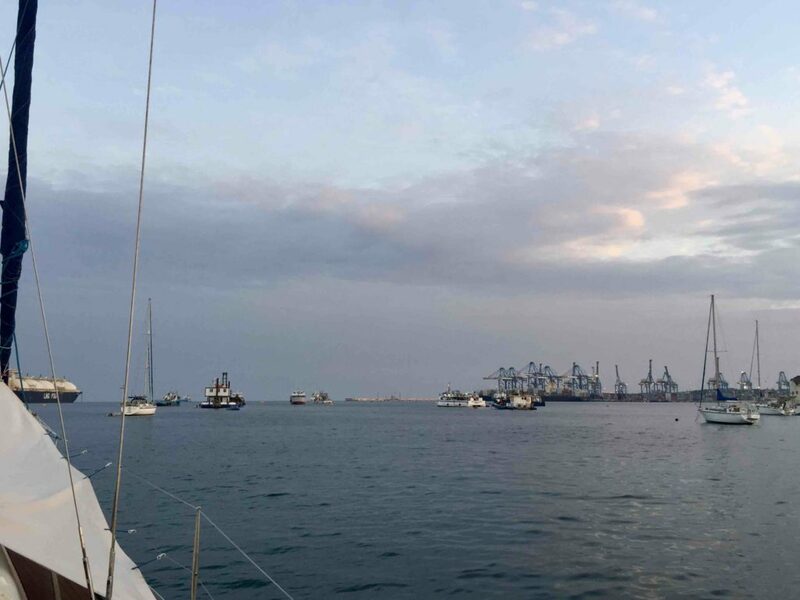 You wouldn’t think this was a suitable cruising area for sailing boats, but at just a few hundred meters distance is an anchorage recommended by many fellow cruisers. 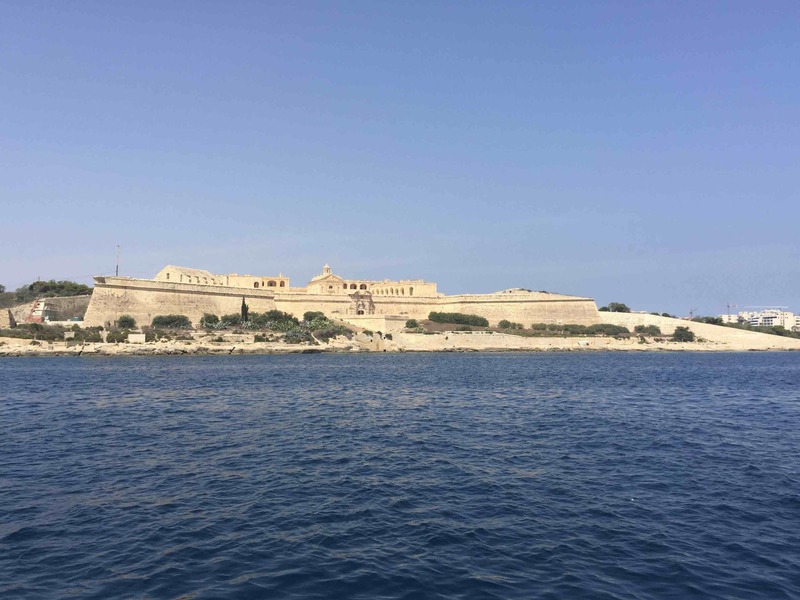 I had taken the helm on the 7th of September and took us out of St. Thomas Bay, avoiding the fishing boats and a big fish farm, towards the most Southeastern point of Malta. On approaching the harbour bay, a large ship was coming up behind us while we had to drive in very close to a moored gas tanker (at least, that’s what I think it was). This was a bit too much for my nerves so I quickly handed the steering wheel over to the captain. The anchorage was behind some moored industrial boats and because it got shallow quite quickly the wasn’t a lot of space. 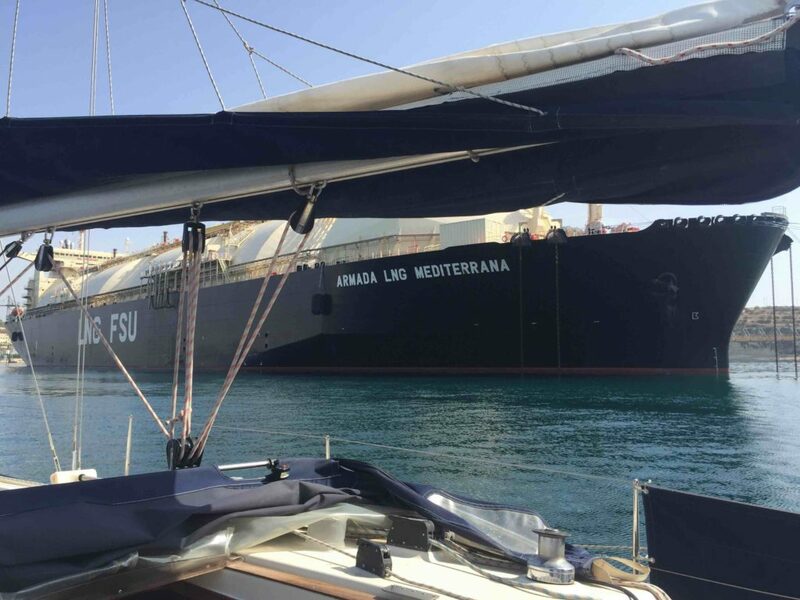 Luckily there were only 2 other boats in the area – one anchored and one on a mooring ball. 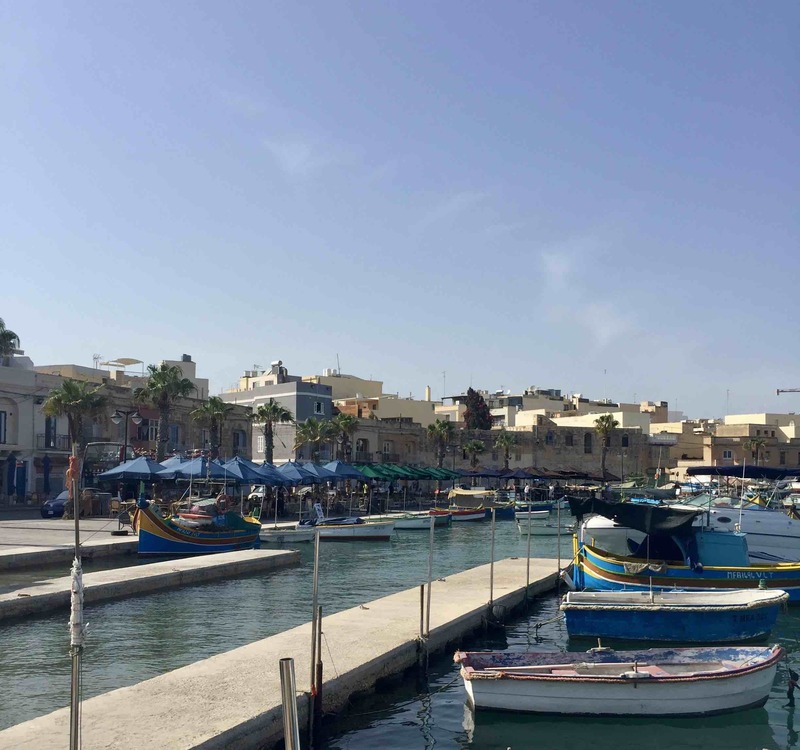 The main reason cruisers come to this place is to visit the small fishing village of Marsaxlokk. 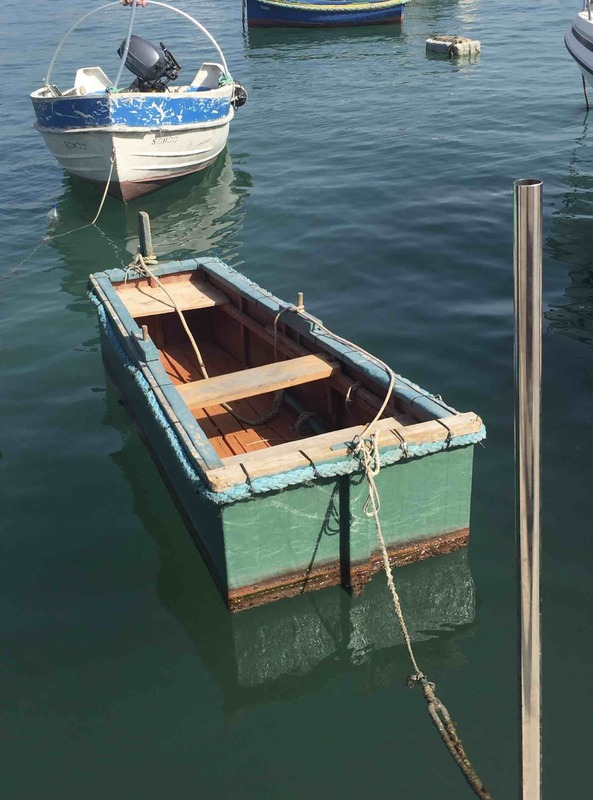 By dinghy you can cross the mooring area full of colourful fishing boats and tie up on the town quay. Here you find lots of (mainly fish and seafood) restaurants and a pretty little town with a very decent Spar supermarket. 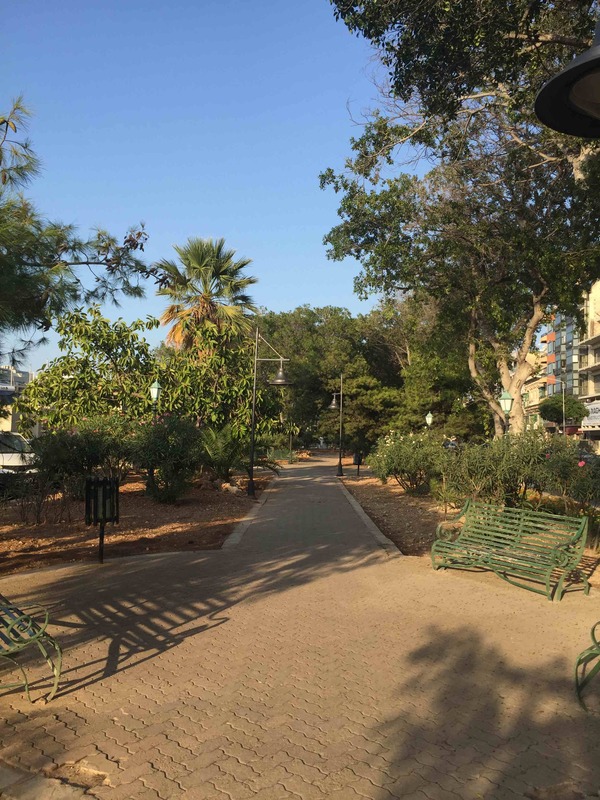 We went ashore a few times to walk the dog, go shopping and to have a meal. 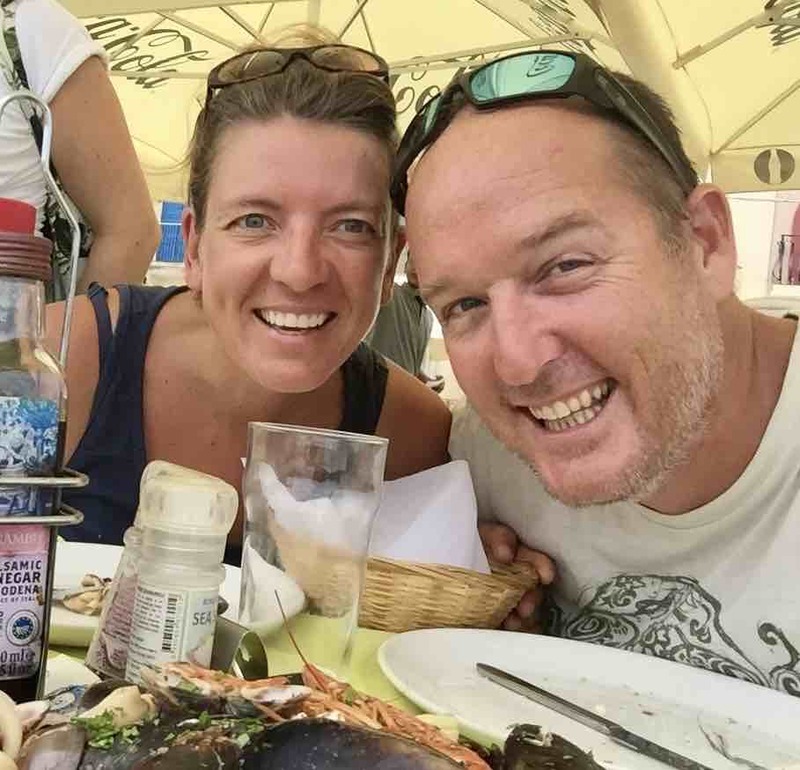 After our experiences in Sardinia, we fully appreciated the pleasure of being able to get on land so easily, throw our rubbish in a public bin and have easy access to a shop. Next to us was this ring in the water. We saw it being towed to somewhere else. We have no idea what it is for, to contain spillage? Something related to fishing? On leaving the harbour we spotted a submarine! 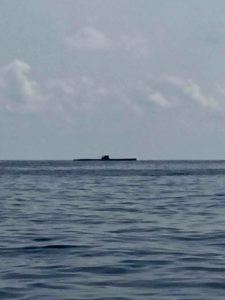 According to local news it was a German U-571 replica. Jon said later that if he’d known it wasn’t an original one from the navy he would have gone closer. 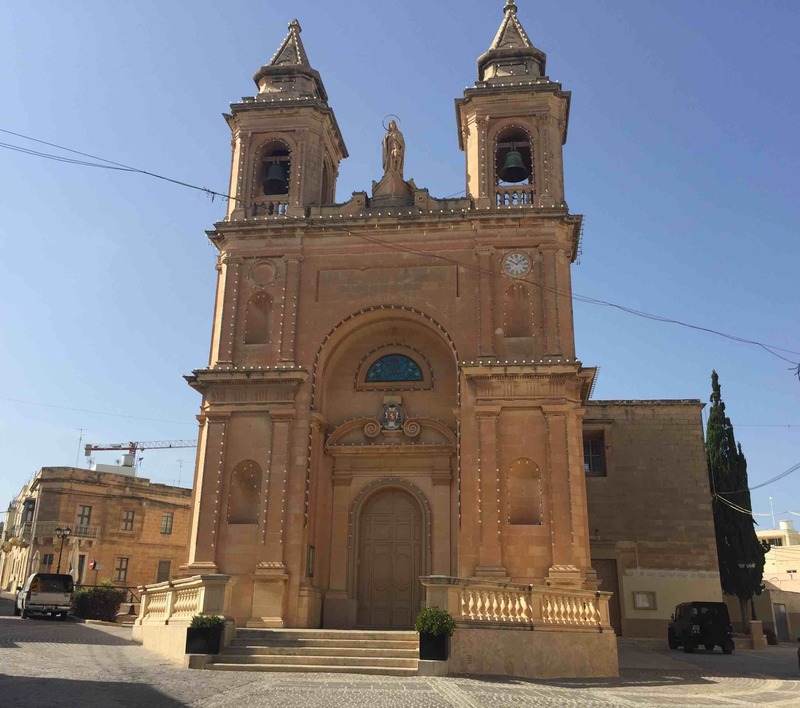 Under the white canopy lies Mnajdra, a megalithic temple complex built in ca. 3500 BC. The Dingli Cliffs – at 253 metres above sea level this is the highest part of the island. We hesitated for a moment when we arrived in Gnejna. To the right of the bay was a mooring field with a lot of little fishing boats. 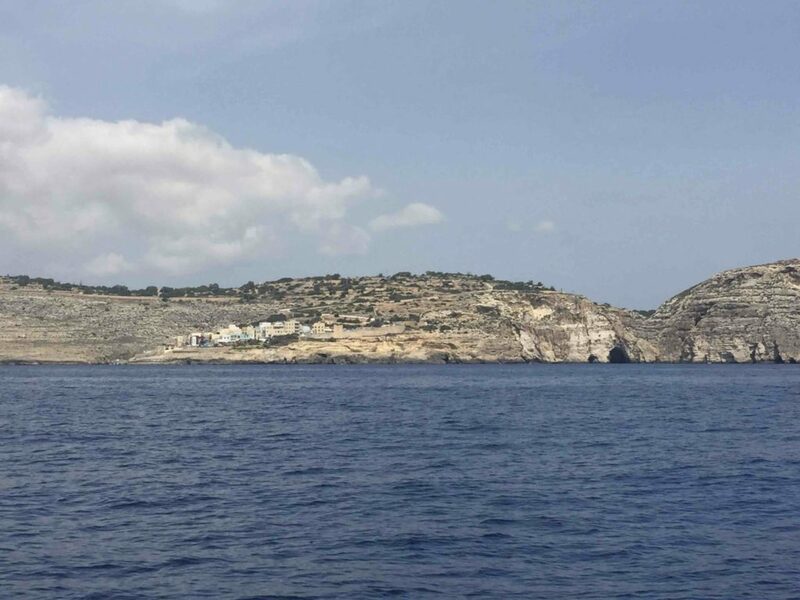 To the left was a beautiful anchoring spot, very well sheltered by the surrounding cliffs, but according to our navigation software there were rocks and shallow places. We decided to drop the anchor in front of the moored fishing boats. Here we were further away from shore but at least we were confident about the depth. At the far end of the bay lay a beautiful beach. No high-rise hotels or apartments here: only a small cafeteria to cater for the sun-worshippers who arrived each day, mostly by car. The shore closest to us consisted mostly of small, single-storey boathouses lined up between the rocks. In olden days these were presumably only used by the local fishermen but these days they appeared to serve as holiday homes for local families. It was a decent place to spend a few days but thanks to the ever changing wind, we were quickly on our way again. 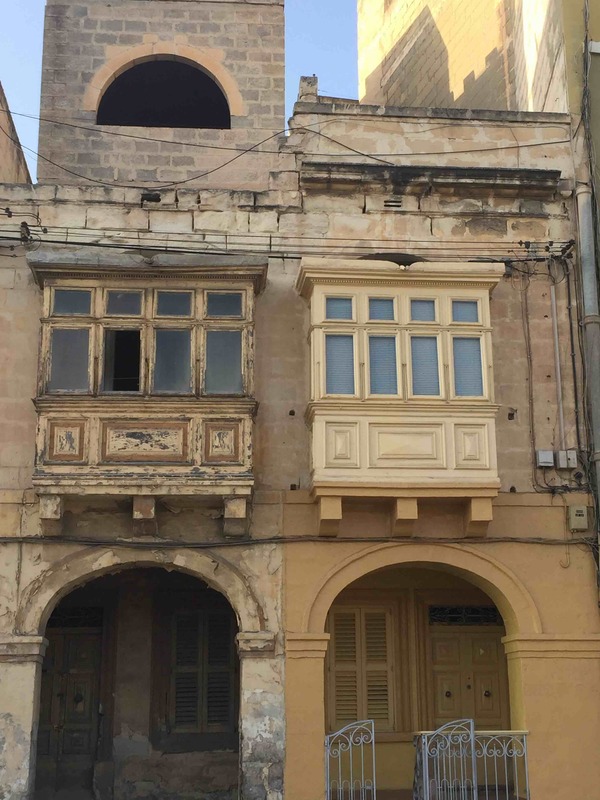 There were a lot more beautiful places in Malta to discover. Nice that you’re enjoying it – the sea is by far and away the best bit of the place! I’ll be glad to be on land for a while though, for a change! We hope so too! Let us know when you get here.